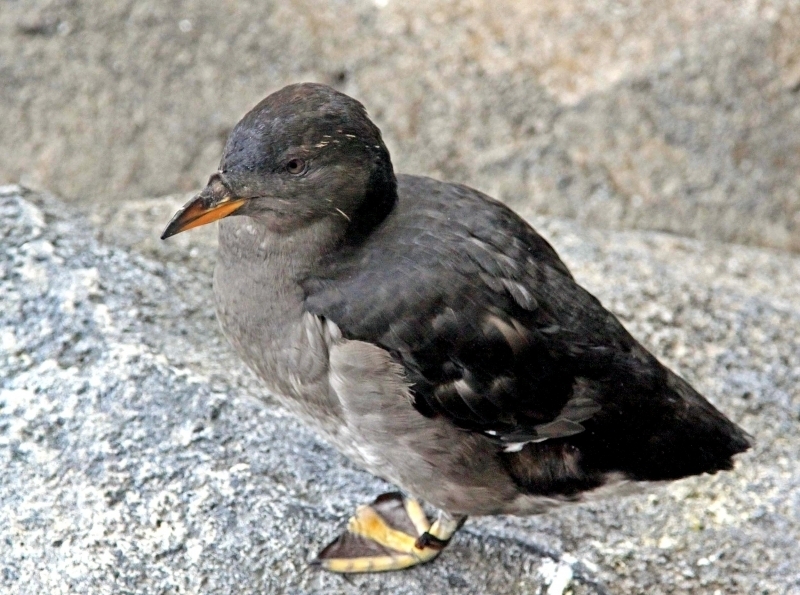 The Rhinocéros Auklet a medium-sized auk, is closely related to the Puffins. 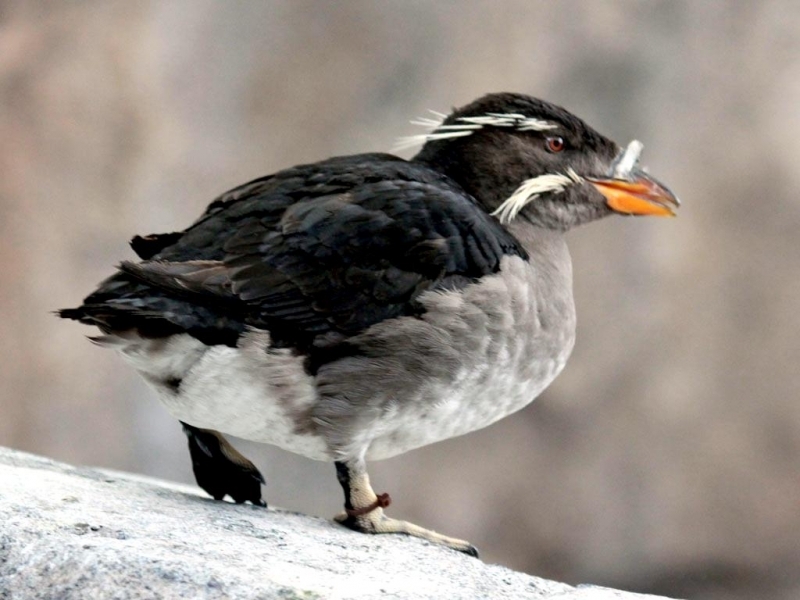 Although dowdier in plumage, it is distinguished from Puffins and all other Auks by a prominent rhinocéros-like “horn” actually a vertical extension of the mandibular plates projecting above the upper mandible in breeding plumage. 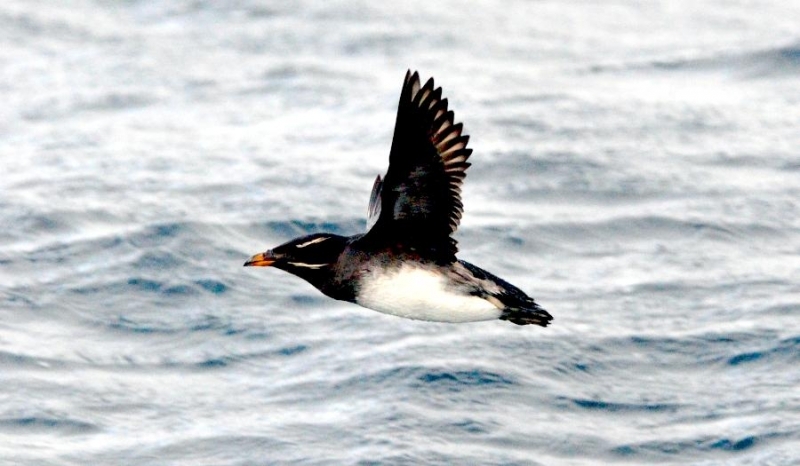 The precise function of this prominent ornament which is the same size in males and females is unknown. 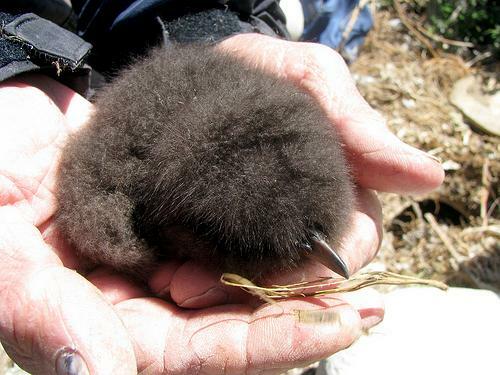 Females lays 1 white egg often spotted, is laid in a burrow and nests in colonies sometimes in large numbers. 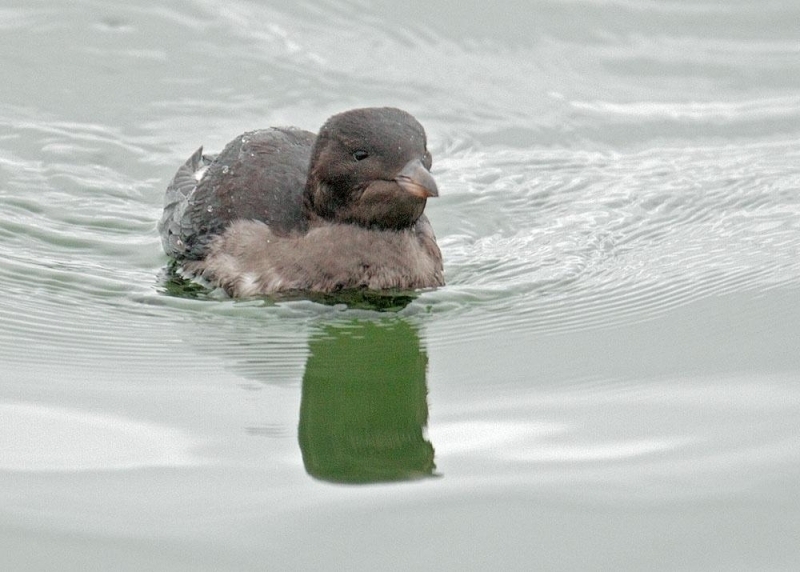 Incubation ranges from 39 to 52 days and is carried out by both parents. 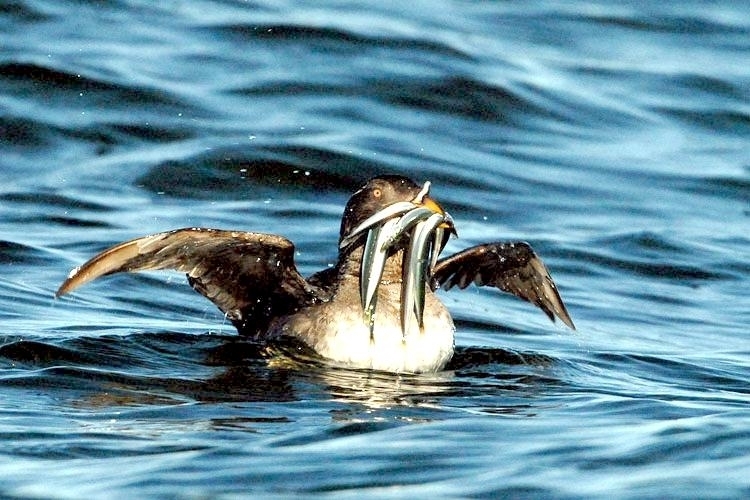 They feed mainly on small fish, but sometimes takes crustaceans and squid; forages by diving from the surface and pursuing prey under water. 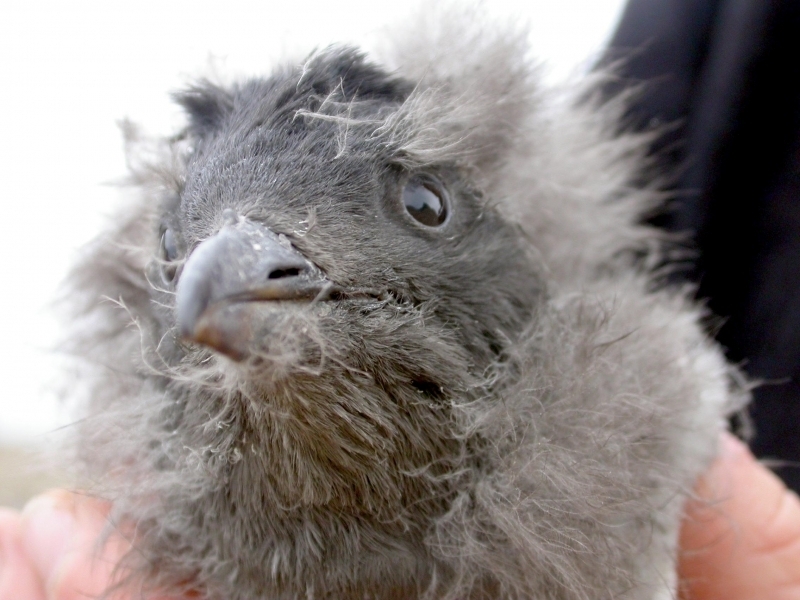 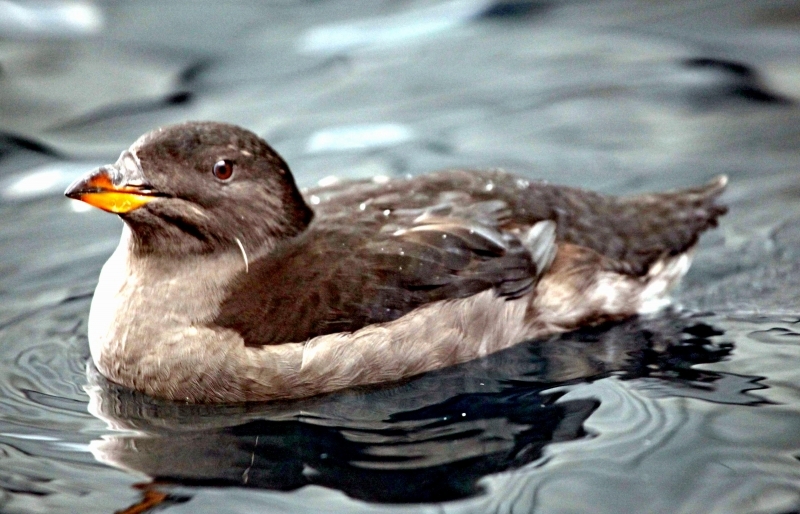 Rhinocéros Auklets nests in colonies on isolated islands where thousands of birds gather to raise their chicks. 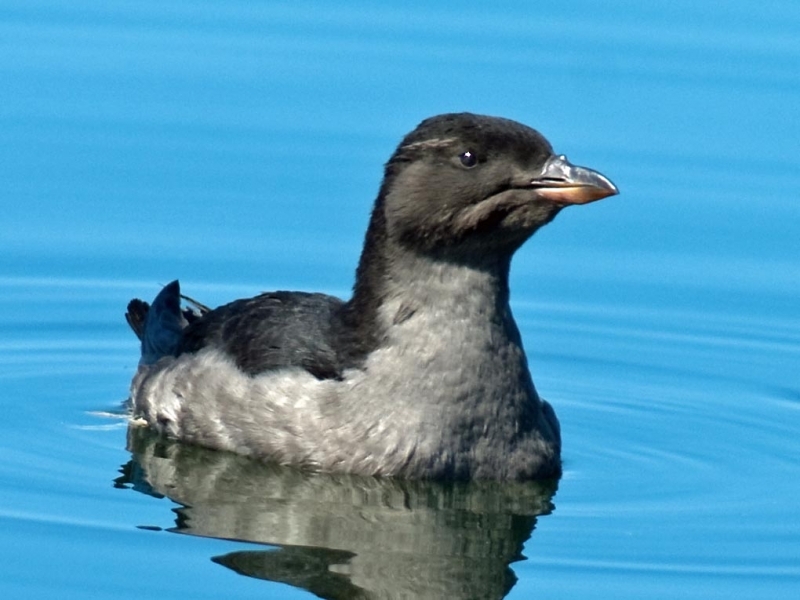 Rhinocéros Auklets dig burrows in the ground on both forested & non-forested islands. 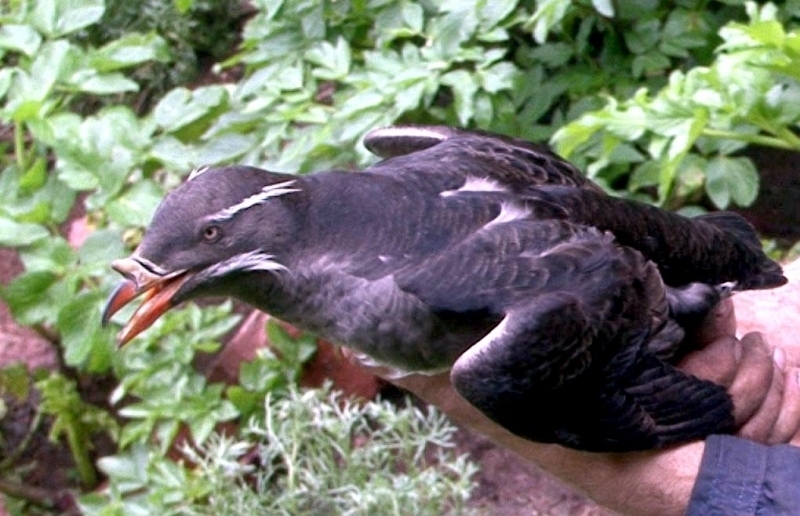 Burrows can be up to 20 feet long and often fork many times. 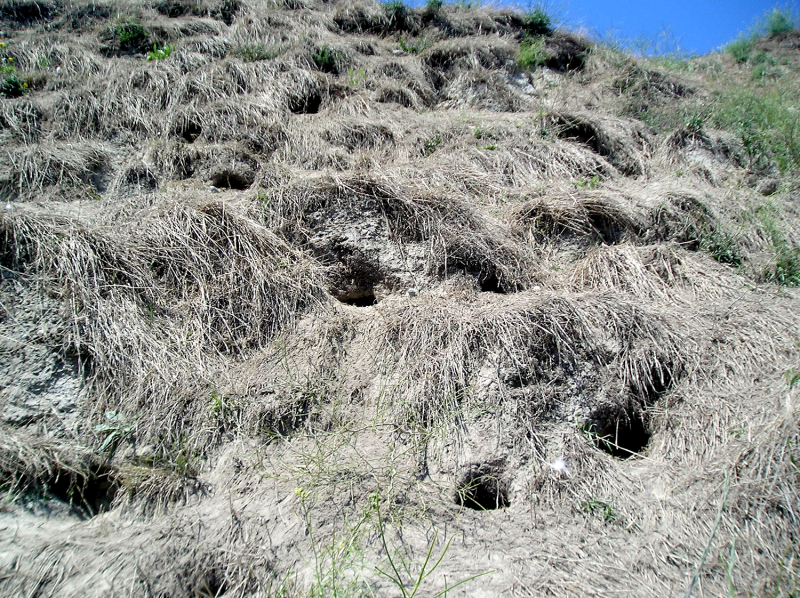 At the end of each burrow, is a nest chamber with a shallow cup of moss and twigs. 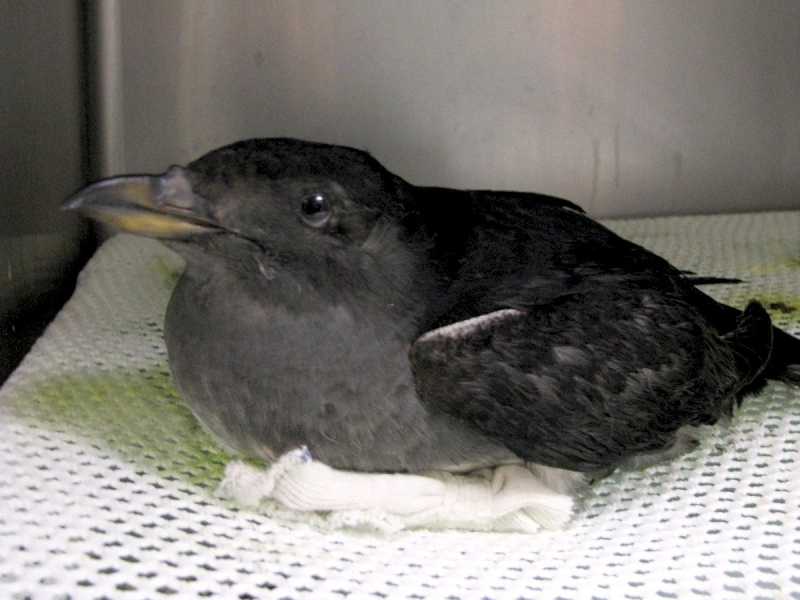 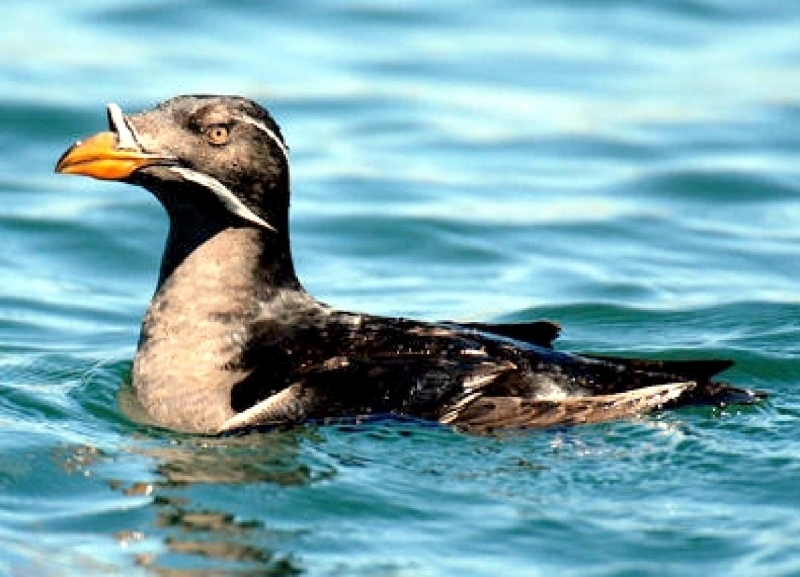 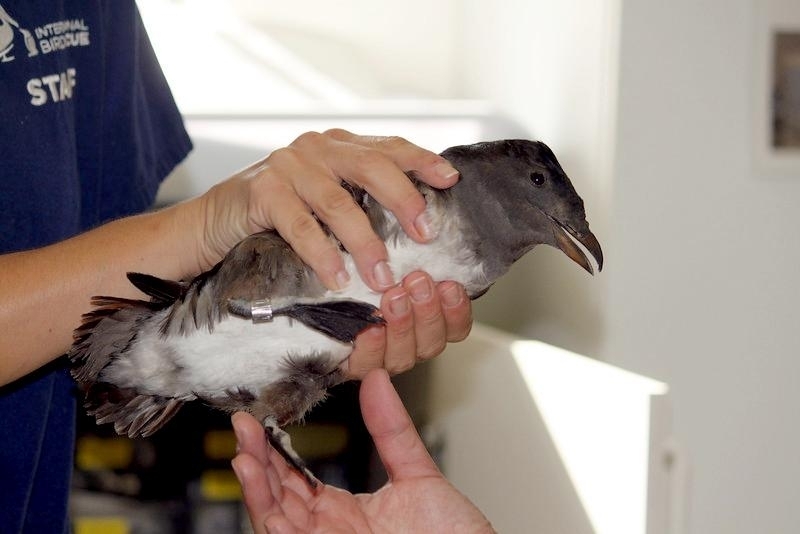 The Rhinocéros Auklet is a seabird of the coastlines and open seas of the north Pacific Ocean. 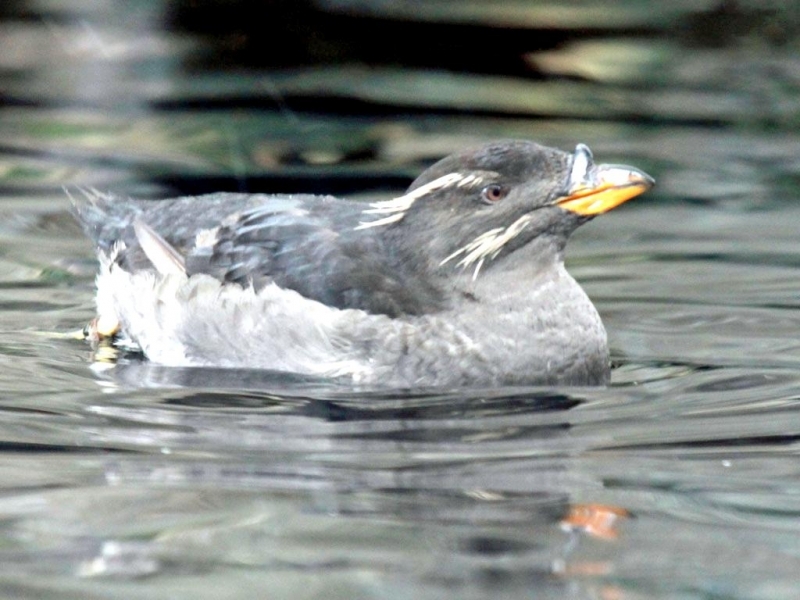 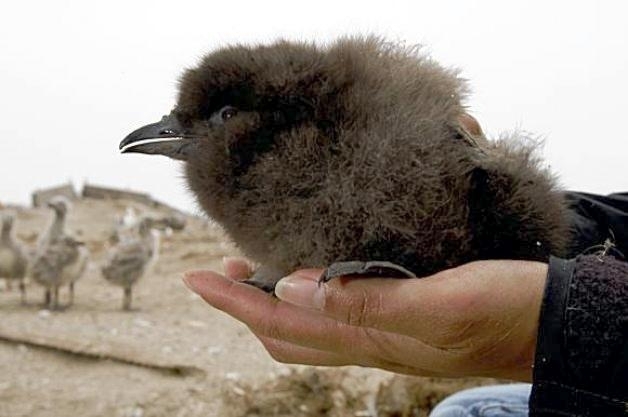 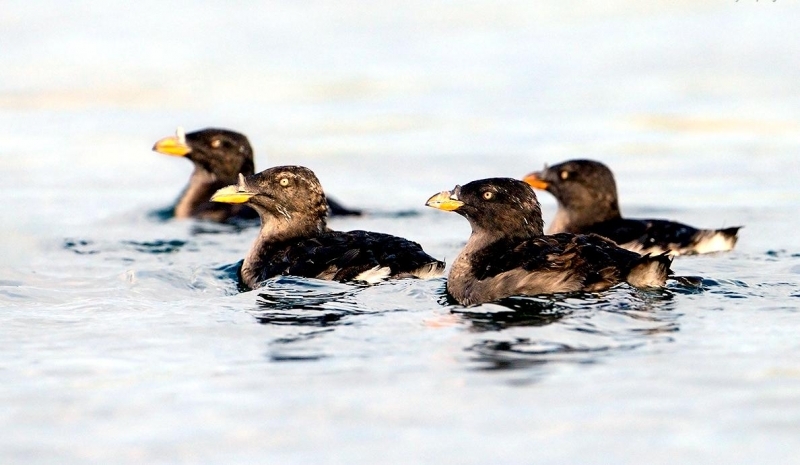 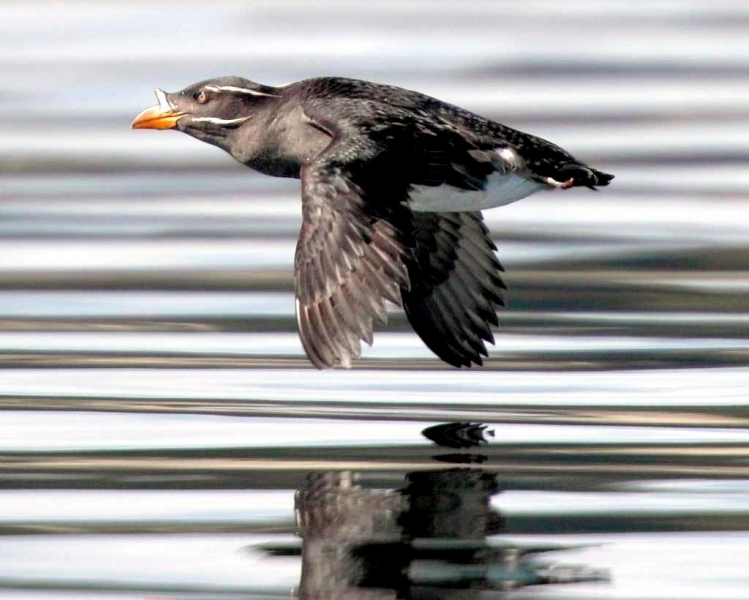 The Rhinocéros Auklet breeds from California’s Channel Islands to the Aleutian Islands in Alaska in North America and Hokkaidō & Honshū, Japan, as well as North Korea and Sakhalin Island in Asia. 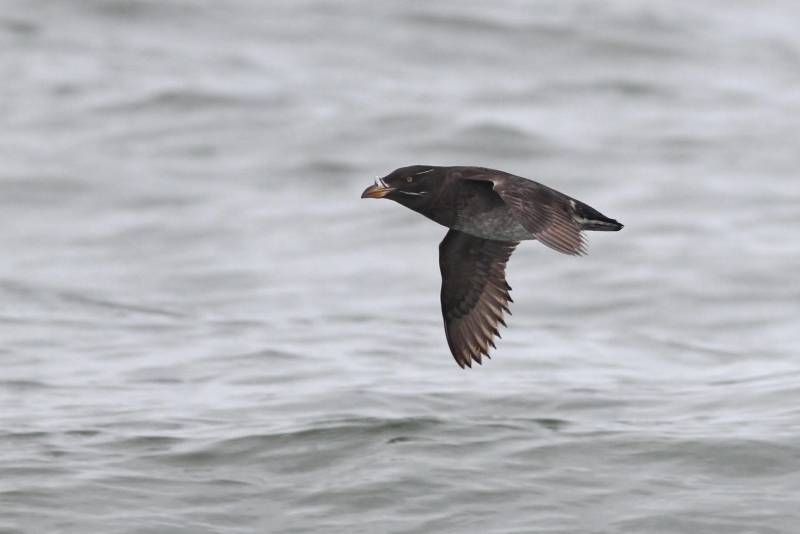 It winters both in offshore and inshore waters, exhibiting some migration. 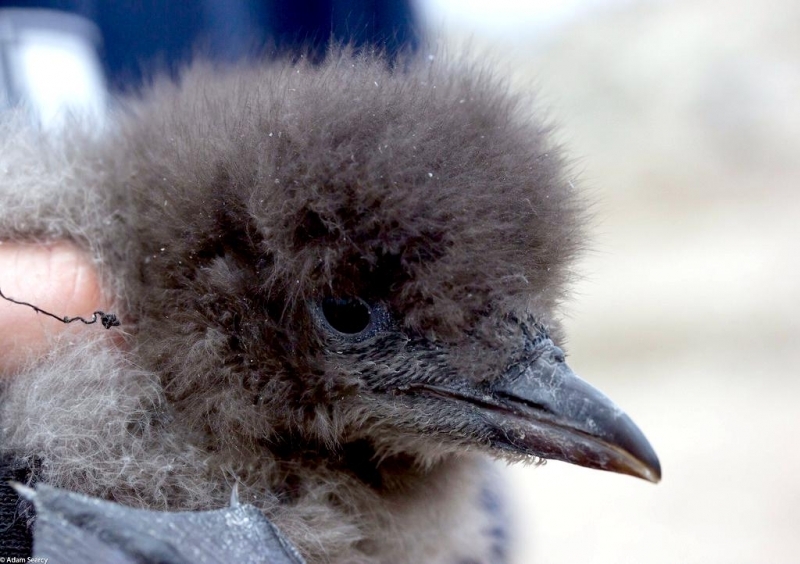 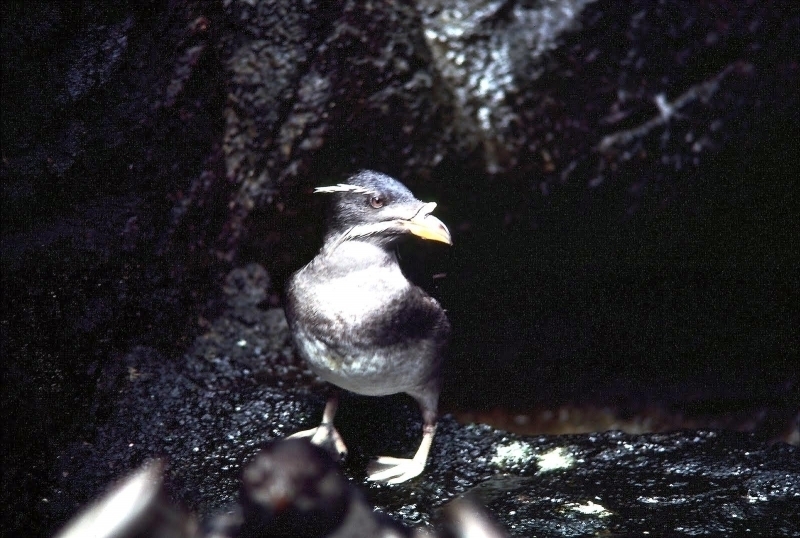 The Rhinocéros Auklet nests in burrows dug into the soil or in natural caves and cavities between 1 to 5 meters deep. 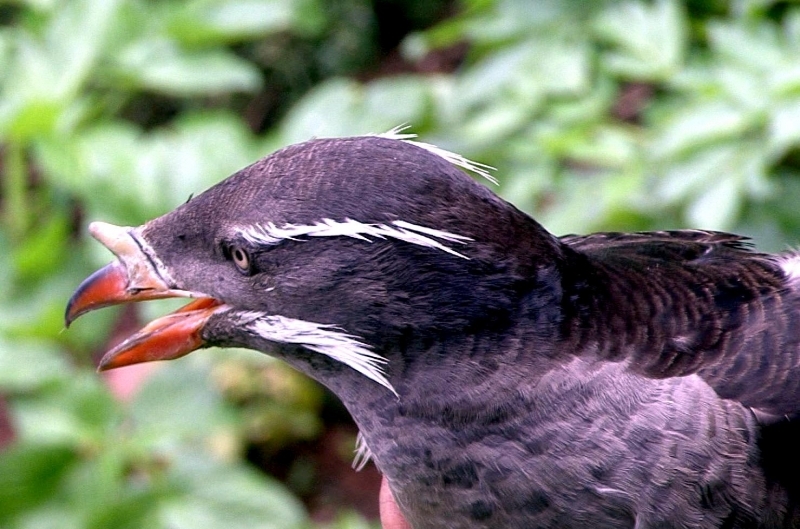 The Rhinoceros Auklet is a large alcid with a wedge-shaped head. 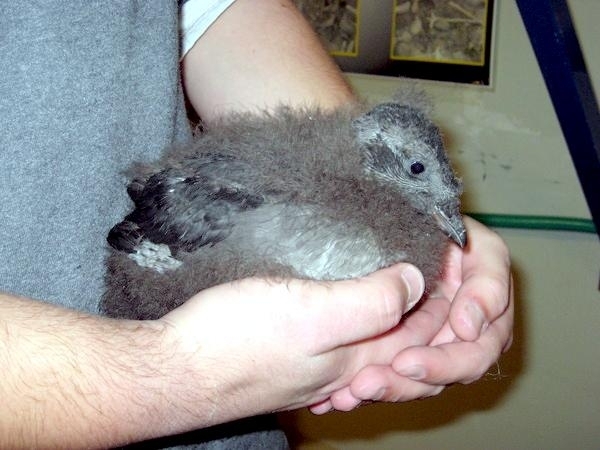 It is drab-gray overall, darker above than below. 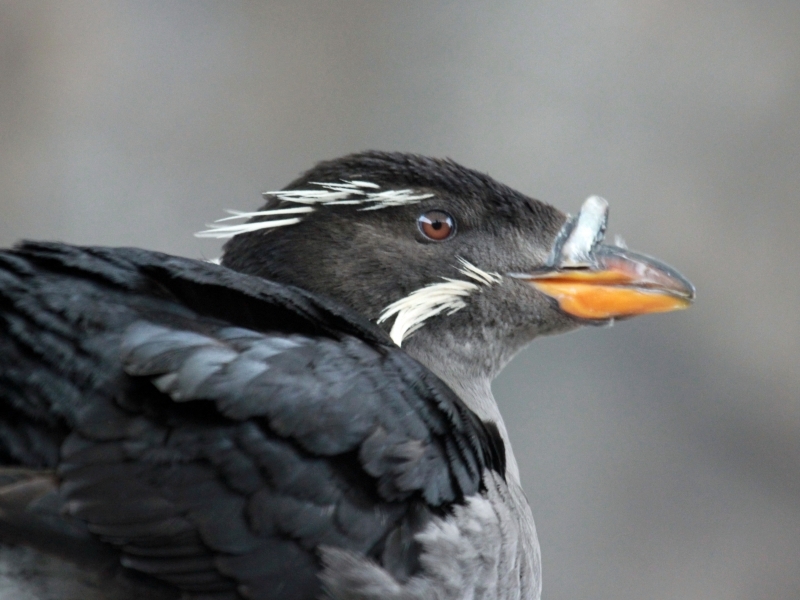 In breeding plumage, they have a bright orange-yellow bill adorned with a whitish horn. 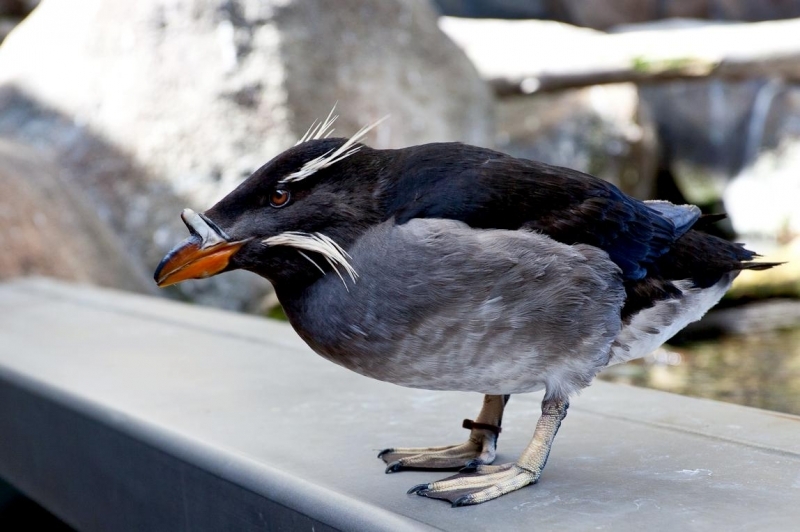 It also has 2 light feather tufts on each side of its head, going in a line back from the eye and the corner of the mouth. 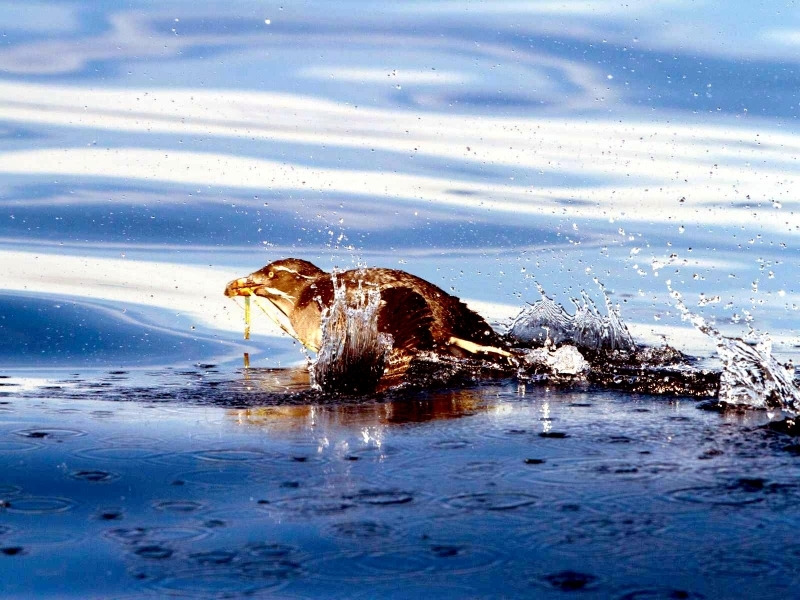 It is the only living species of the genus Cerorhinca. 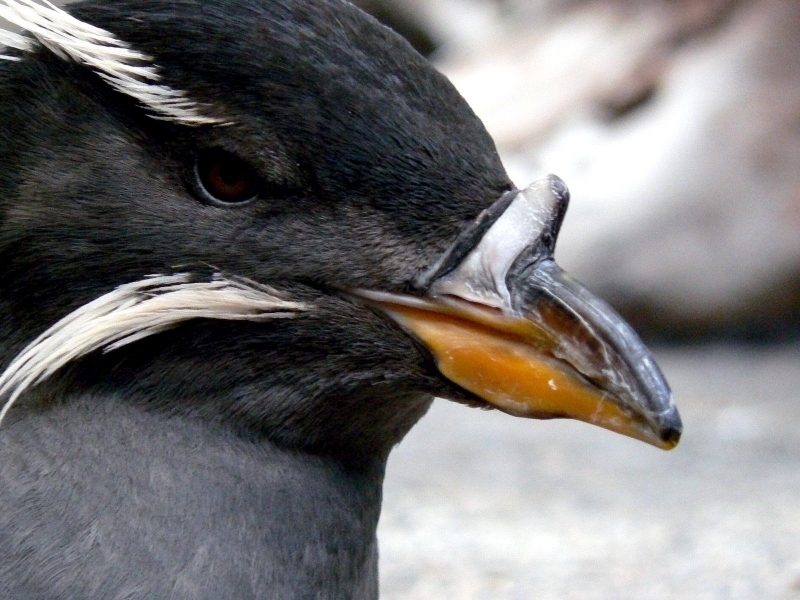 The Rhinocéros Auklet gives a series of 7 to 12 mellow “moo” notes sound much like a cow when near the colony. 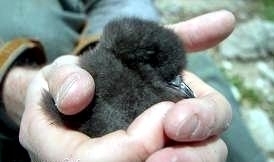 This is done to aid in location of its mate at night. 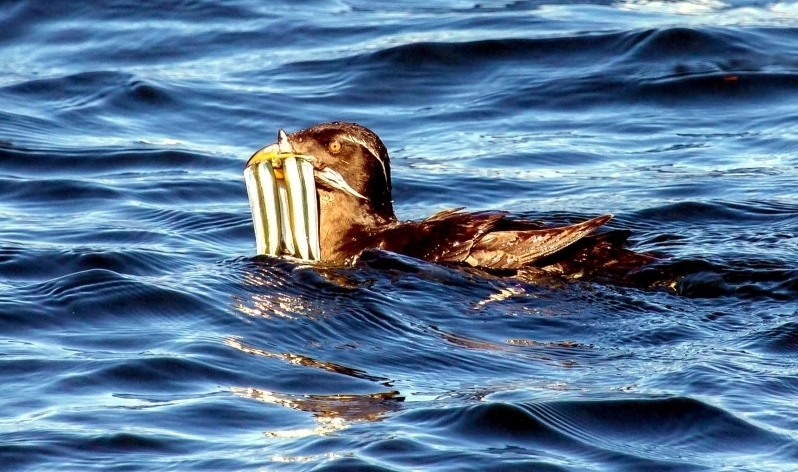 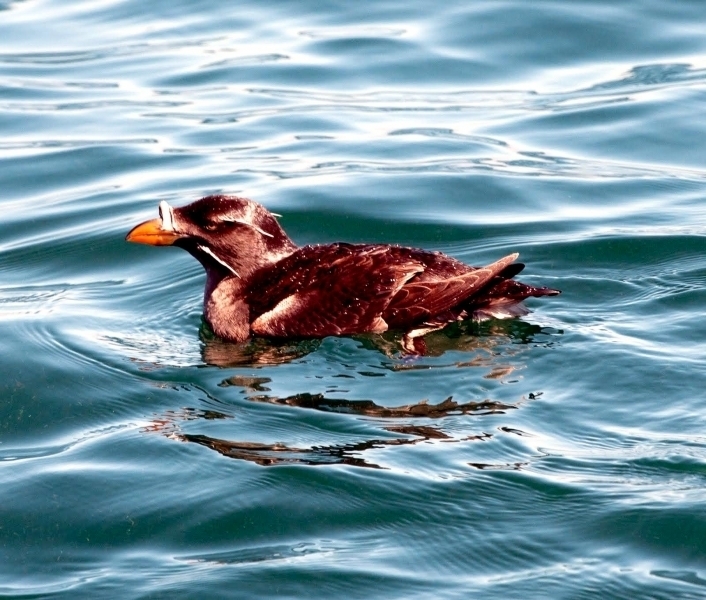 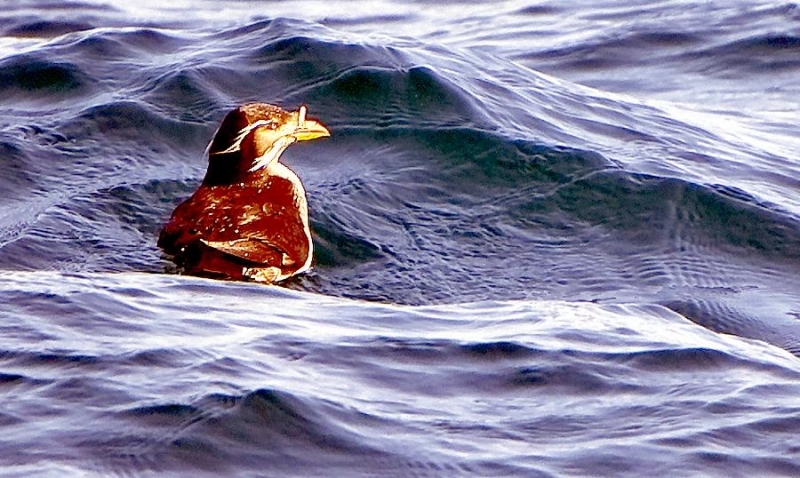 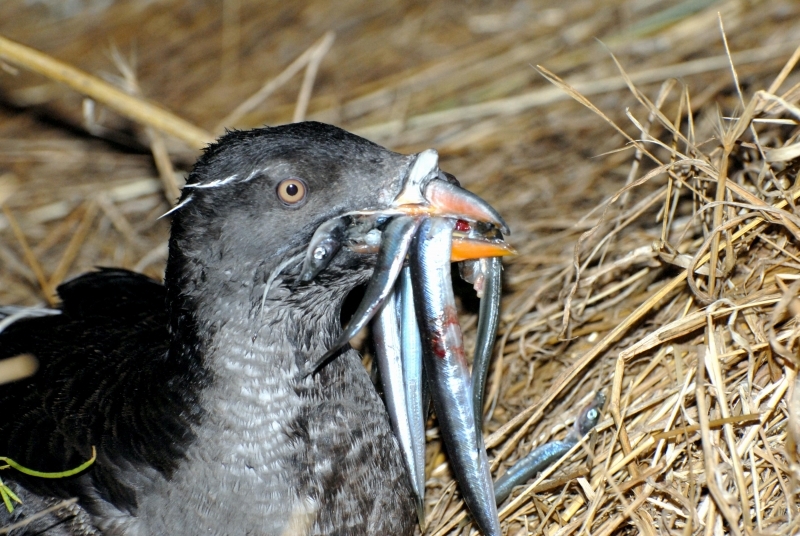 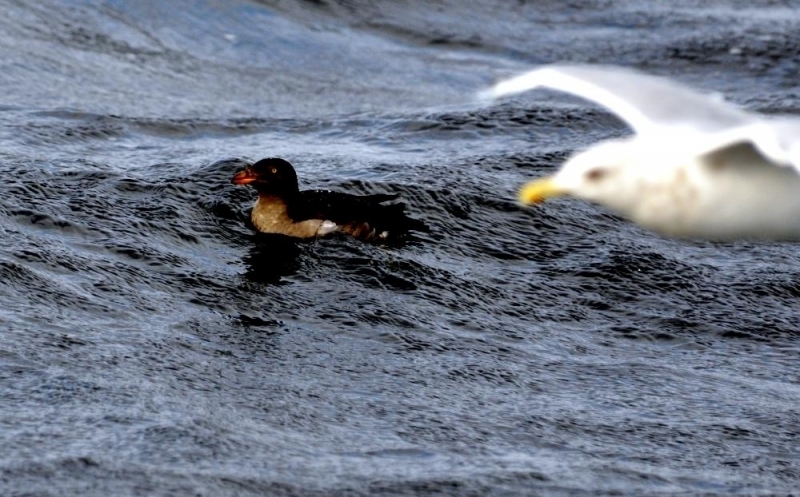 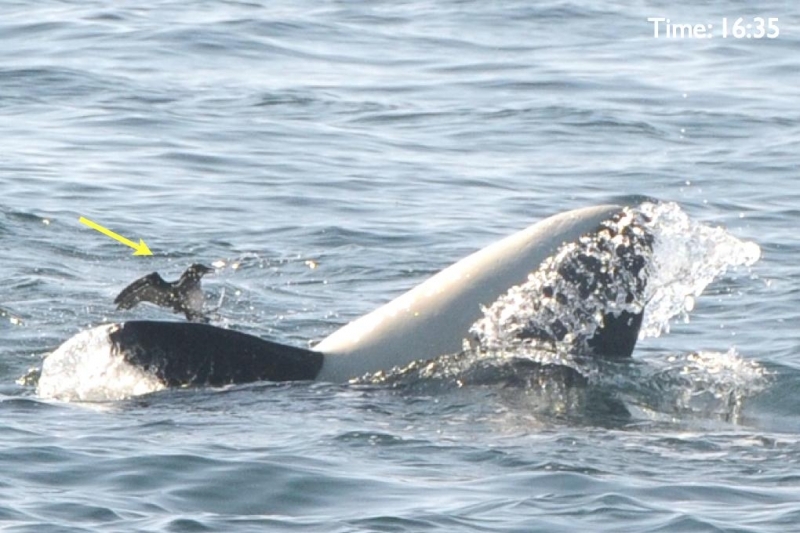 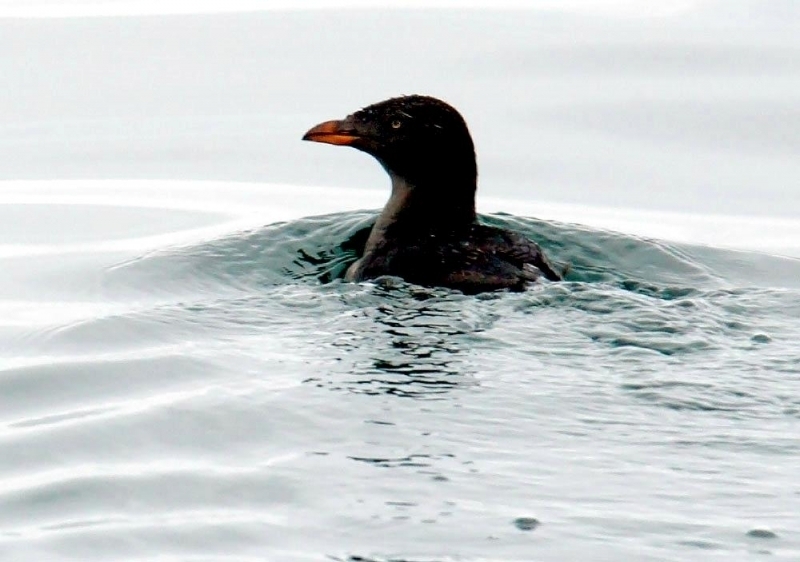 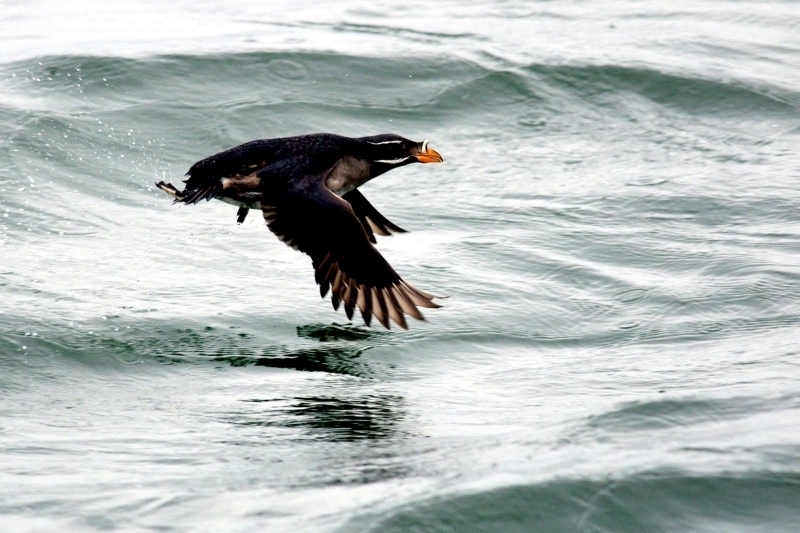 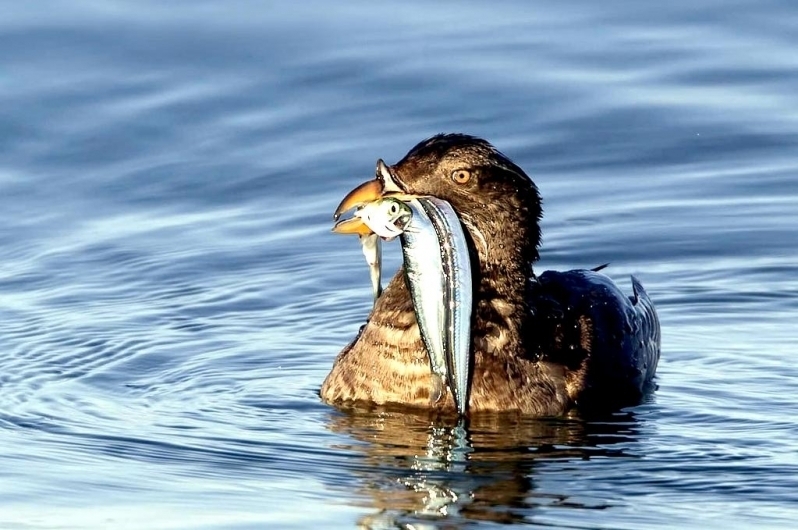 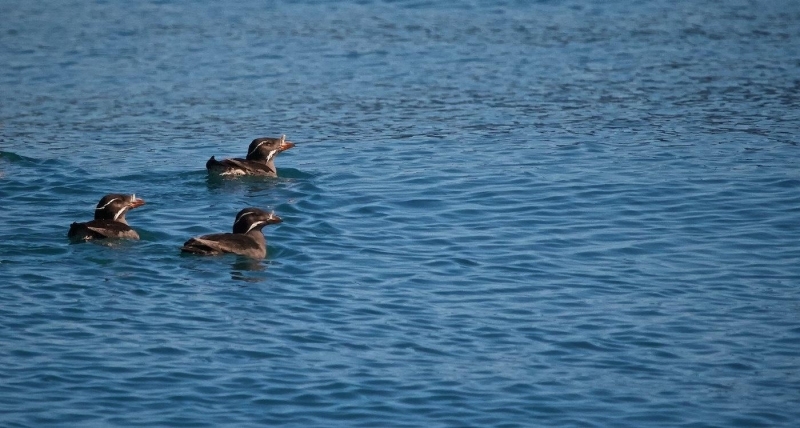 At sea, Rhinocéros Auklets feed on fish with some krill & squid taken also. 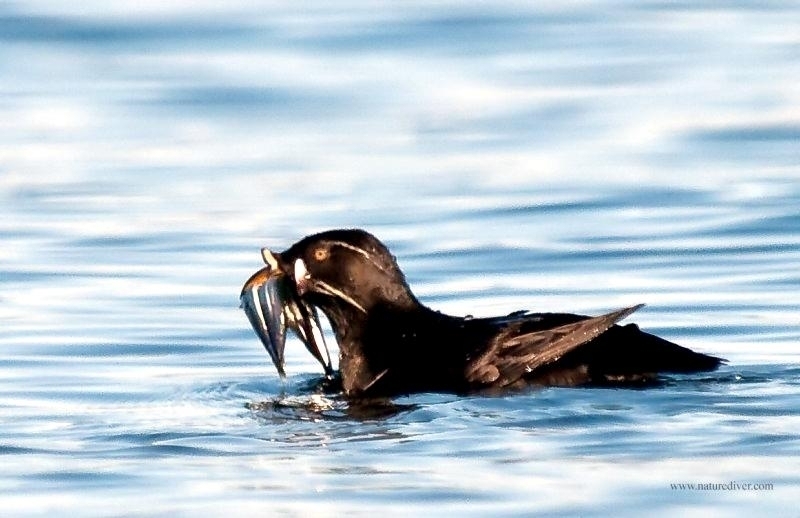 They feed inshore during the breeding season in the mid-water. 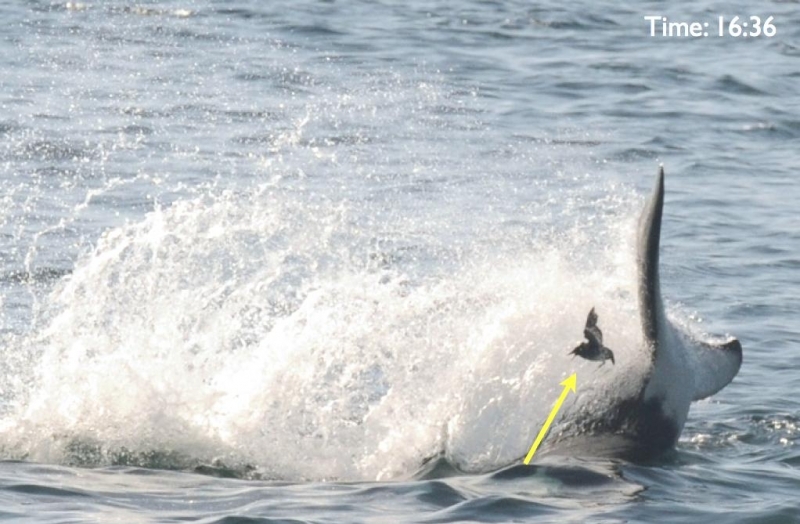 To catch their prey, they dive to as deep as 187 feet for as long as 148 seconds. 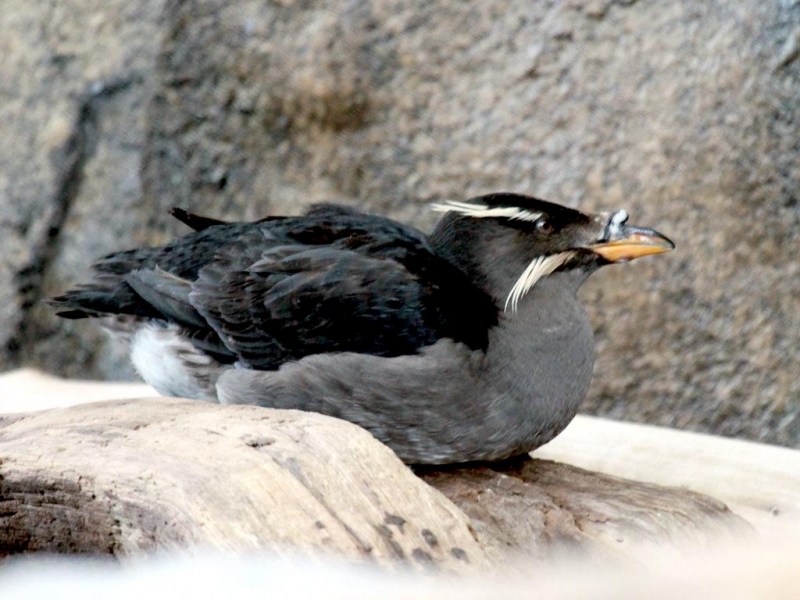 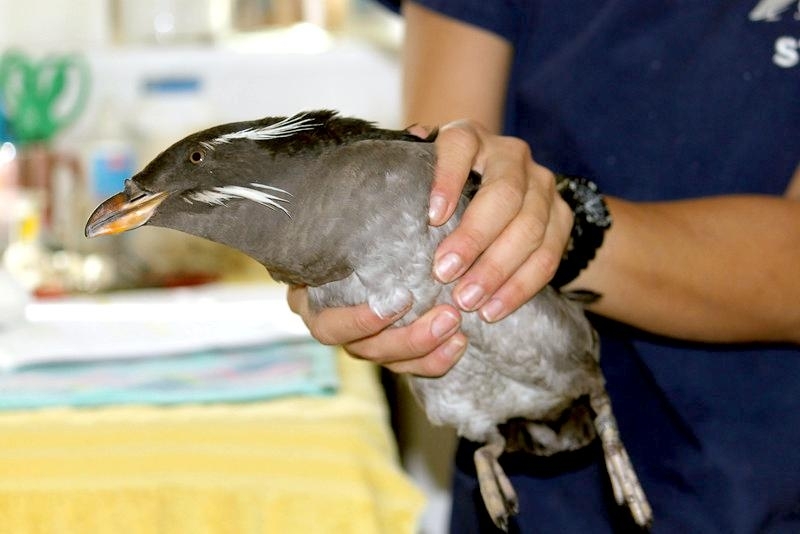 The Rhinocéros Auklet is an unusual member of the Alcidae family. 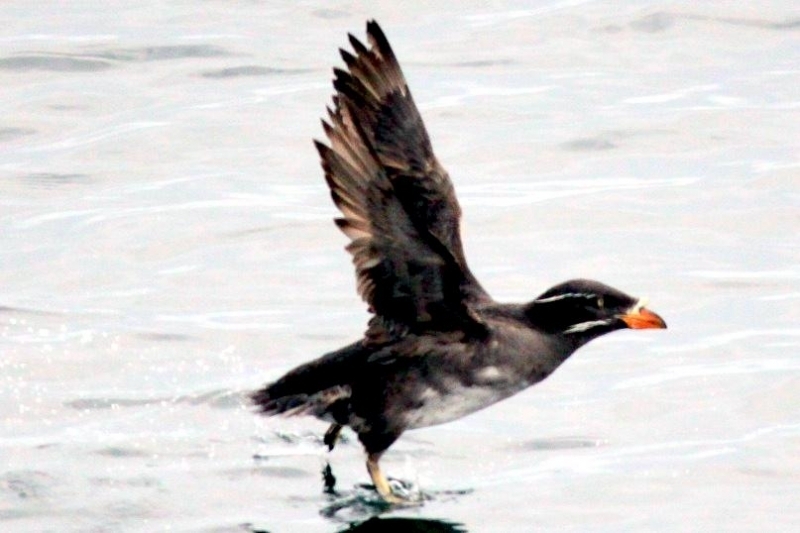 It is actually a Puffin, not an Auklet but its outward appearance differs noticeably from other Puffins. 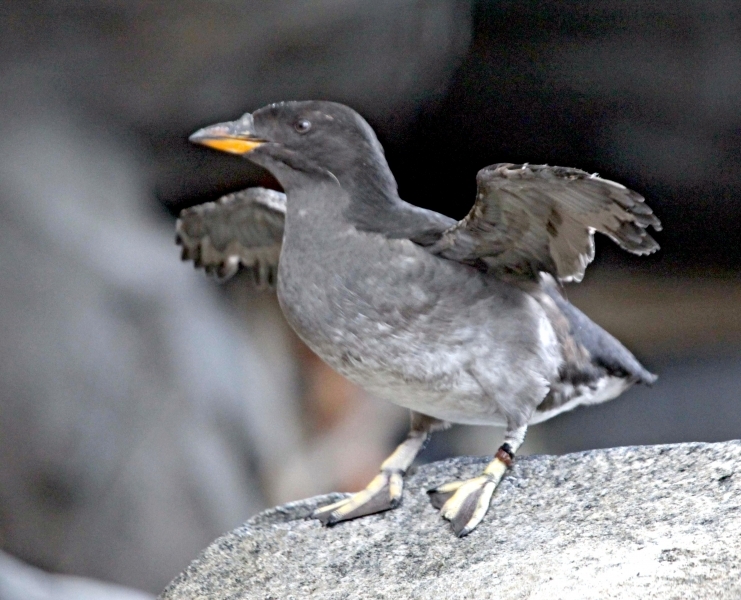 A medium-sized seabird at 500 grams, the Rhinocéros Auklet has mostly gray plumage that is darker on the back and a white and grey belly. 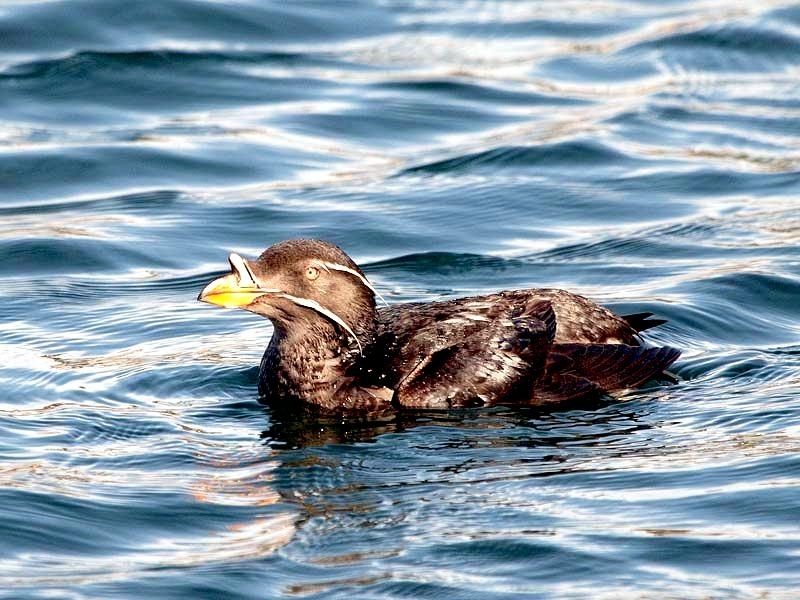 It has yellow eyes and a thick, pointed yellow bill.